Ten to fifteen years ago, finding and completing your own legal forms were some of the harder aspects of representing yourself in divorce court without an attorney. Today, however, there are no shortage of options for preparing your own divorce forms, and the bigger challenge seems to be choosing the best product for you. In researching the various no cost or very low cost options, we consistently see the same problems. The free options are often too limited to allow you to address all of the issues in your divorce. You think you have all the forms you need to get divorced, but find out at an inconvenient time that you're actually missing forms. Finally, if you get instructions with your forms, they tend to be far too general to provide effective guidance or give you the confidence you need to be successful in the divorce process. Does not include property and/or debt division. Does not allow spouses in the military. Does not support minor children, or if supported, missing child support and custody/visitation. Does not include a spousal support (alimony) option. Many free form offerings are a series of boilerplate blank forms. Some aren't even state-specific. Filling these out can be painstaking and mistake prone. Often, free form options claim to offer complete form packages, but actually only offer forms to begin the divorce. This leaves pro se filers scrambling to locate and complete final documents at the last minute. It may also mean having to hire an attorney to represent you at the end of the divorce process. Representing yourself without an attorney can be intimidating, especially when you don't know what documents to file or when to file them. Free instructions tend to be too general and fail to provide the level of detail needed for you to feel confident in your ability to handle representing yourself. Especially problematic is that most of these instructions provide no guidance on how to obtain a hearing date when one is required in your state, and further provide no sample testimony or guidance for you when you are at the divorce hearing. Unlike with free or pay-for-print only options, with DivorceWriter, your options aren't limited. If you have jointly held property and/or debts, they need to be included in the divorce. If one spouse is in need of spousal support (alimony) failing to including it in the divorce will usually result in it being waived permanently. Judges are rarely comfortable leaving issues like child support, custody and visitation unresolved in divorce cases, and even if your judge is willing to do so, it is rarely in the best interest of the family to leave these matters unsettled in the short-term only to have to return to court to resolve them down the road. While not every divorce will include all or even some of these options, failing to include an option that applies in your case could have disastrous consequences down the road. With DivorceWriter, we let the customer decide whether to include any of these issues in the divorce. While free and pay-to-print forms consistently lack Settlement Agreements, Parenting Plans, and Child Support Worksheets, and sometimes even lack the Decree/Judgment forms to finalize a divorce, with DivorceWriter you get everything you need to get divorced in your state. With DivorceWriter, you complete our online interview. Then, your information is transferred to forms by our automated system to generate complete, professional looking divorce documents that are ready to sign and file. While it's extremely important to have complete forms that will work for your state, it's also vital that you understand the process that lay ahead of you. In particular, knowing when to sign and file documents and what deadlines apply in your state are essential. Instructions on how to obtain a court date, guidance on what testimony to provide at the divorce hearing, and whether or not a witness is required at your hearing are included for every state. If your county has specific requirements, we include those, too. 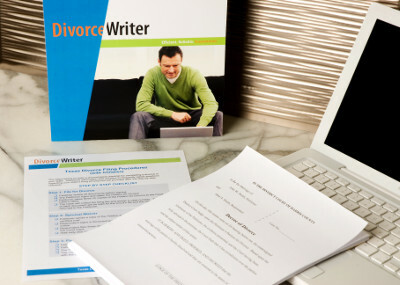 DivorceWriter provides step-by-step, easy-to-follow instructions that are clear and help give you the confidence to successfully represent yourself in your divorce case. DivorceWriter receives regular feedback from our customers, and in any given year, we're in contact with hundreds Court Clerk's offices across the county. This gives us unique opportunities to constantly fine-tune and refine our product--from our online interview to forms to instructions to our DivorceWriter Help Center. We are able to keep our forms current and up-to-date. More than a decade of offering self-help divorce products has provided us with invaluable experience, which we continue to use to make DivorceWriter the best value for your money. There are a number of reasons why you may need to make changes to documents either before or after filing for divorce. If you make an error or omission in the online interview that you don't discover until you have an opportunity to review your completed document, fixing it is easy. Simply log in to your account and make the desired changes. If your documents are not accepted by the Court, DivorceWriter offers a money-back guarantee.